In the hotel Villa Bianca businessmen will find the hospitality and the services they are looking for. Indeed, the hotel is very close to the main business centers of the territory and the Wi-Fi connection is present in all the rooms and common spaces of the hotel. Besides, the restaurant offers a rich breakfast thanks to a delicious buffet which is perfect to start a long hectic and tiring working day. Furthermore, you can book your business lunches and dinners following your needs and asking for special menus and different hours from the normal schedule. 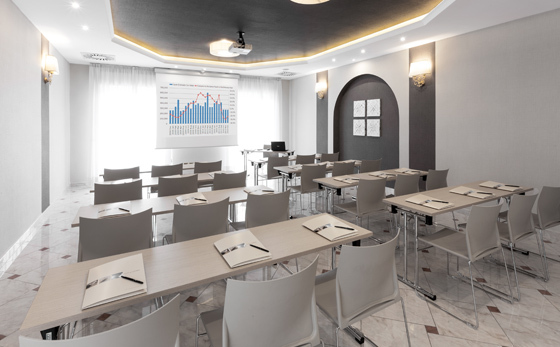 Our guests may also use the four meeting halls in Hotel Villa Bianca: they have room for 150 persons, an ideal space for business rendezvous and companies’ meetings .